Welcome to reviews of the best Prevue bird cages and Prevue Hendryx accessories. Prevue Pet Products has been working in this industry for over 150 years – their main advantage is that you know you’re getting consistent, professional quality. 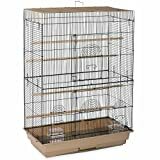 They offer a broad range of small bird cages and larger flight cages as well. Some of their higher end products are even made from wrought iron and chrome. We’ve looked through the best that Prevue has to offer so you don’t have to and we’ve judged their cages on quality, design, ease of use and price. From this we’ve discovered the best, cheapest and largest bird cages and flight cages that Prevue has to offer. So read the comparison table below so you can find the Prevue bird cage that matches your needs. All of the materials used in the construction of the bird cages are made from non-toxic materials and are bird safe. The large bird cages are made from last lasting wrought iron with steel meshes whereas the small bird cages mostly are made out of just steel mesh. Every cage has at least 2 trays: one for water and one for food. They all have bases that are either removable or easily accessible for cleaning and maintenance. Every cage comes with at least 1 perch (but usually several more). Each cage can be delivered online, and directly to your doorstep – no pick up necessary. All of the smaller cages are aimed at birds such as budgies and parakeets whereas larger bird cages are made for birds such as large parrots, macaws and conures. Because Prevue Hendryx have been in business for over 150 years they have a lot of experience and hard earned knowledge. This shows through with their bird cages as the quality of their manufacturing is consistently to a high standard. The types of bird cage stands that are on offer include rolling rectangular/square shaped stands and also hanging bird cage stands. The wheel rolling stands are built to be easily moved around your house and each comes with a shelf for holding extra food, toys and cleaning supplies. One example of these can be found here. Whereas the hanging bird stands each come with 4 tubular steel legs which provide a strong and steady base and provide extra height from where you can have your bird cage on display. An example of these can be found here. Prevue currently sells 2 high quality but affordable bird cage covers: one for medium sized bird cages and the other for larger cages. They’re made from nylon fabric that is breathable for your birds, non-toxic and are built to block out any light. They’re lightweight so can be easily taken off and washed. The medium bird cage cover is available here, whereas the large one can be found here. There’s a range of different sized perches that Prevue makes for it’s different cages. The larger perches are ones that are made of metal or hardwood and tend to installed in cages for larger birds. This is because larger birds generally have stronger beaks and are more likely to break the smaller perches. On the other hand, the smaller perches fit the feet of smaller birds, tend to be made of cheaper wood. Amongst the bird toys available are bird swings, mirrors, chimes, shells made from coconuts and more. These are good for stimulating the senses of your bird and keeping them entertained for hours. Bird toys are especially necessary if you have any solitary birds. There are literally hundreds of other items that Prevue offers so it’s worth taking a look here if you need extra accessories. Some recommended products you might want to checkout include ladders, nests and bird baths. You can also consider looking for used Prevue bird cages from a secondhand source (commonly Ebay or Craigslist). However, you’ve got to be careful when doing this as you need to check for dents, breakages and any defects. This can be difficult to do upon first inspection or when buying online. Whilst you might find some cheap Prevue bird cages on offer, when you buy secondhand there’s not going to be any warranty or guarantee. Because of all these factors we recommend buying a new Prevue bird cage instead. For more information on buying a used bird cage, see our guide here. 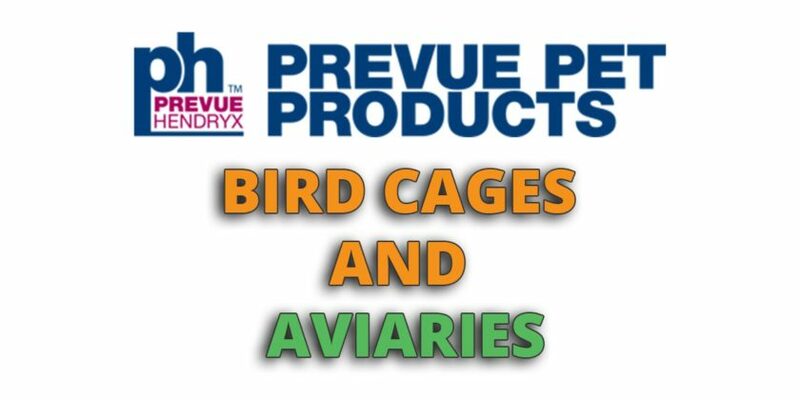 Prevue bird cages are perhaps one the most prolific bird cages brands that is out there. They provide pretty much any type of bird cage or accessory that you can think of. Whilst the type of bird cage and accessory varies a lot – what remains consistent is the quality behind the workmanship. We recommend checking out some of the cages at the top of the page and from this making a decision yourself. Also, if you have any opinions on Prevue Hendryx or thoughts you want to share then please fill in the comment form below.